Sixty years ago today, Ruth Orkin captured the imaginations across the globe with this iconic photo titled "American Girl in Italy." 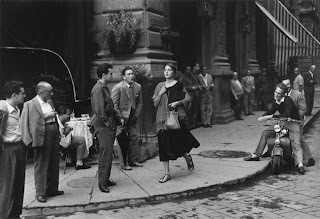 According to Ninalee Craig (also known at that time as Jinx Allen) , subject woman in the photo, 23 years old at the time, the photo was not a symbol of harassment as many assumed, but an honest portrayal of an American woman having a wonderful time in Italy and enjoying the moment of being admired by 15 Italian men. Ninalee Craig is now a great-grandmother living in Canada. The photographer, Ruth Orkin, who passed away in 1985, also co-wrote and co-directed the 1956 Oscar-nominated film "Little Fugitive." In a telephone interview Craig confirmed on NBC that the photo was not staged and "symbolizes independence and fearlessness not harassment," see Today People article by Laura T. Coffey. More photos by Ruth Orkin at Bulger Gallery. For more information visit "American Girl in Italy: 60 years later" by Mike Kromboltz of The Lookout.